ZnO nanoparticle–based multilayer nanocomposite films were fabricated on cationized woven cotton fabrics via layer-by-layer molecular self-assembly technique. For cationic surface charge, cotton fabrics were pretreated with 2,3-epoxypropyltrimethylammonium chloride (EP3MAC) by pad-batch method. XPS and SEM were used to examine the deposited nano-ZnO multilayer films on the cotton fabrics. The nano-ZnO films deposited on cotton fabrics exhibited excellent antimicrobial activity against Staphylococcus aureus bacteria. The results also showed that the coated fabrics with nano-ZnO multilayer films enhanced the protection of cotton fabrics from UV radiation. Physical tests (tensile strength of weft and warp yarns, air permeability and whiteness values) were performed on the fabrics before and after the treatment with ZnO nanoparticles to evaluate the effect of layer-by-layer (LbL) process on cotton fabrics properties. Layer-by-layer assembly (LbL), invented by G. Decher, is a unique technique for the fabrication of composite thin films. The sequential adsorption of oppositely charged polycations and polyanions on solid surfaces leads to the buildup of polyelectrolyte multilayer films. The sequential multilayer deposition can be carried out by immersing the substrate into the cationic and anionic solutions, alternately. After deposition of each layer, the substrate is immersed into the washing solution. Both adsorption steps can be repeated cyclically to form multilayer structures on the surface of a substrate. A wide range of functional molecules can be incorporated within the film, including nanoparticles, dyes, proteins and other supramolecular species [1–5]. In various fields of science such as anti-static coating for plastics, sensors, light emitting diode, fuel cells, polymer capsules, etc., multilayer films containing nanoparticle have been extensively studied for their potential use, but only a few studies have been concluded for textile materials [4–12]. Generally, polyelectrolyte self-assemblies of different textile fibers and structures were studied and these studies investigated only the possibility of using LbL method for textile materials [13–18]. There are only a few studies about the use of nanoparticles for multilayer film deposition on the textile fibers [19, 20]. It is interesting to note that, any report that determined durability of the functional properties multilayer films after washing procedures on the textile materials was not found. The LbL process has initiated the easy preparation of nanocomposite textile fibers to be used in the manufacture of functional textiles for protective clothing. The LbL technique provides opportunity to improve the surface properties of textile fibers by depositing nanolayers of polyelectrolytes, charged nanoparticles and non-reactive dyes in a controlled manner. Zinc oxide nanoparticles are widely used in different areas such as sunscreens, coatings and paints because of its high UV absorption efficiency and strong antibacterial activities on a broad spectrum of bacteria . ZnO nanoparticles are an attractive semiconductor which provides widespread potential applications. For this purpose, the synthesis of different shape and size of ZnO structures (such as ZnO nanoparticles, ZnO nanoarrays, hollow ZnO microspheres, hexagonal ZnO architectures, etc.) has gained much attention [22–26]. The application of nano-particles to textile materials is the primary object of several studies aimed at producing functional textiles. There are a few methods in the literature that describe the coating of fabrics with ZnO nanoparticles, for example, the pad-dry-cure method, radiation, thermal and chemical treatments. Since these techniques generally require several stages, extra chemical compositions or a stabilizer agent, a new method must be considered for nano-ZnO treatments onto textile materials [27–30]. In the present study, an attempt was made to improve functional cotton fabrics by the deposition of multilayer films containing ZnO nanoparticle. Cationic cotton fabrics were prepared through cationization process. Scanning electron microscopy (SEM) and X-ray photoelectron spectroscopy (XPS) measurements were performed to verify the presence of the deposited nanolayers. Antibacterial activity against Staphylococcus aureus bacteria and UV protective properties of the fabrics due to the character of the deposited ZnO nanolayers were also tested. Air permeability, whiteness values and tensile strength analyses were performed to examine LbL process efficacy on the cotton fabric properties. In addition, the durability of antibacterial properties was analyzed after 10 and 20 washing (40°C and 30 min) cycles. Zinc oxide nanoparticles (particle size <100 nm, surface area 15–25 m2/g) were purchased from Aldrich and used for multilayer film composition as mentioned below. Nanoparticle suspension was prepared at 40 W for 1 h by Sonics Vibra-Cell Ultrasonic Homogenizer. The concentration of suspension was adjusted to 0.1 wt%. The isoelectric point of ZnO is at pH 8.6 . The pH of ZnO nanoparticle suspension was adjusted to 3 and 11 by using HCl and NaOH, respectively. Mercerized and bleached 100% cotton woven fabric (the fabric parameters are plain weave, 138,84 g/m2, 56 ends/cm, 31 picks/cm, 50/1 yarn count) was used as substrate for the LBL process. The fabric was cut into ~18 × 25 cm pieces before cationization process. To generate cationic sites on the surface of cotton fibers, cationization process was used . Cationic cotton fabric was prepared by using 2,3-epoxypropyl trimethylammonium chloride (EP3MAC). EP3MAC was prepared in aqueous solution by reacting 3-chloro-2-hydroxy propyl trimethyl ammonium chloride (CHP3MAC) with NaOH. As EP3MAC reacts with the hydroxyl groups of cellulose, cationic charges on the surface of the sample were created. CHP3MAC (65%) and NaOH crystals were obtained from Aldrich. In 200 ml of deionized water, 100 g of CHP3MAC and 45.5 g of NaOH were added. This solution was pad applied to the cotton specimens at 100% wet pickup, and fabric samples were kept for 24 h at ambient conditions (20°C and % 65 RH) in Ziploc bags. Cationized cotton fabrics were dried in a commercial dryer at 60°C. Random samples which were cut from the fabrics were dyed with anionic dyes to ensure that the cationization process had formed. For multilayer deposition process, polypropylene transport trays (20 cm × 30 cm) were used. In the deposition process, the positively charged cotton fabrics were immersed into the sequential solutions alternately for 5-min periods: (a) anionic ZnO colloid solution (b) deionized water, (c) cationic ZnO colloid solution, (d) deionized water. This deposition cycle was considered as one cycle depositing 2 layers and repeated until 10 and 16 multilayer ZnO films were deposited on cotton fibers. Multilayer film deposited on cotton fabrics was dried at 60°C and cured at 130°C for 3 min. XPS measurements were conducted by using a SPECS spectrometer with an Mg source and a spherical mirror analyzer working in spectrum mode. The total pressure in the main vacuum chamber during analysis was typically 4 × 10−7 Torr. The chemical elements present on the samples were identified from survey spectra. The survey scans started at 1,100 eV and ended at 0.80 eV taking 0.40 eV steps with a dwell time of 0.30 ms. High-resolution scans were performed around peaks of interest. QUANTA 400F Field Emission high-resolution scanning electron microscope (SEM) was used to examine the surfaces of woven cotton samples at an acceleration voltage of 10 kV. The cotton fabric samples were coated with 10 nm Au/Pd prior to SEM observation. Tex Test Instruments FX 3300 Air Permeability Tester III instrument was used to obtain the air permeability values of the untreated and nano-ZnO film–deposited cotton fabrics at 100 Pa pressure according to EN ISO 9237 Standard. Minolta 3600d spectrophotometer was used to obtain the whiteness values of the untreated, cationized and nano-ZnO film–deposited cotton fabrics as Stensby index with using D 65 light sources. The mechanical tests were performed on a Lloyd LR5K Plus electronic tensile strength machine according to EN ISO 2062 Standard. The breaking strength and elongation of warp and weft yarns at fracture were tested. Twenty samples were used for each test, and the test results were evaluated with SPSS 16.0 statistical analysis program. ISO 20645 Textile Fabrics-Determination of Antibacterial Activity-Agar Diffusion Plate Test Method was used to obtain antibacterial activity of the multilayer film–deposited cotton fabrics against Staphylococcus aureus (Gram positive) bacteria. The ability of a fabric to block UV light is given by the ultraviolet protection factor (UPF) value. UV Penetration and Protection Measurement Systems, Camspec M350 UV/visible Spectrophotometer (SDL/ATLAS) were used to obtain mean UV-A, mean UV-B and mean UPF values of the multilayer film–deposited cotton fabrics according to Australian/New Zealand Standard AS/NZS 4399:1996. Antibacterial activities of nano-ZnO film–deposited cotton fabrics were analyzed after LbL process. To determine the durability of the antibacterial property, cotton fabric samples were washed 10 and 20 times at 40°C for 30 min with laboratory type washing machine Gyrowash. The multilayered fabric samples were subjected to laundering according to EN ISO 20105-C01 standard test method, and AATCC standard detergent without optical brighteners was used throughout the laundering cycles. X-ray photoelectron spectroscopy was used to examine the surface chemical state analysis in the assembly process of nano-ZnO nanoparticle film onto the woven cotton fabrics. A survey scan XPS spectrum of cationized woven cotton fabric is shown in Fig. 1. As expected, distinctive peaks at 283.95, 399.6 and 530.11 eV indicate the presence of carbon, nitrogen and oxygen, respectively. Figure 2 shows a survey scan XPS spectrum of 10 and 16 multilayer ZnO nanoparticle film deposited on cationized cotton fabrics. Distinctive peaks at 283.95, 530.11 and 1,033.7 eV indicate the presence of carbon, oxygen and zinc, respectively. With LbL deposition process, the Zinc peak shows increase in intensity with increase in layer number. To evaluate the elemental contents of the cationized, 10 and 16 multilayer film–deposited fabrics, XPS-% elemental analysis was performed and obtained results are shown in Table 1. During the cationization process, a trace amount (0.8%) of nitrogen was generated in the cationized samples. Zinc amount is found as 17.7 and 18.8% for 10 and 16 multilayer ZnO nanoparticle film–deposited cationized cotton fabrics, respectively. Oxygen is mainly originated by the OH groups in the surface of the cotton fabric; but with nano-ZnO film deposition, the percentage of oxygen is expected to decline in the ten multilayered fabrics due to the attachment of ZnO nanoparticles with OH groups of cellulose. 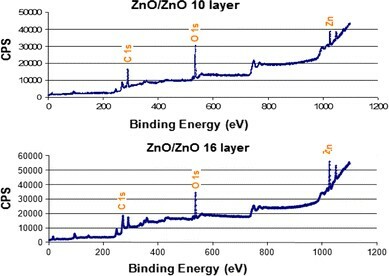 In 16 multilayered fabrics, oxygen content is expected to increase with the increase in ZnO content because of the oxygen element coming from the ZnO nanoparticles. To verify the presence of the nano-ZnO–deposited nanolayers on cationized cotton fabrics, SEM was used. Figure 3 illustrates 20 and 100 μm SEM micrographs of 10 and 16 multilayer ZnO nanoparticle film–deposited cationized cotton fabrics. The surface of the cotton fibers appears to be covered by ZnO nanoparticle solutions and rough surface were obtained in both conditions. Since ZnO nanoparticles were dissolved during the pH calibration (at pH 3 with HCl) of the suspensions for LbL deposition process, the crystalline phase of ZnO was changed in the resultant ZnO film–deposited cotton fibers. Before the layer-by-layer deposition process, nanoparticle solutions were prepared. For cationic ZnO solution the pH value was adjusted to 3 and at this pH value with HCl, ZnO nanoparticles were dissolved. Because of this reason, in multilayered films, due to cationic ZnO nanoparticle dispersion was deposited on the top of the film, ZnO nanoparticles were not observed in the SEM micrographs in the crystalline form clearly. To evaluate the LbL process efficacy on fabric properties, air permeability and whiteness values according to Stensby index of the untreated and multilayer–deposited fabrics were determined and results are shown in Table 2. Air permeability tests showed that with increase in layer number, the air permeability values of the fabric decreases approximately by 11 and 33.5% for 10 and 16 nano-ZnO multilayer film–deposited cotton fabrics. These results verified the presence of the deposited layers on the cotton fiber. Similarly, whiteness values of the fabrics decreases as the number of layers increases. Nevertheless, the decreasing of the whiteness values will not cause to change yellowing of the fabric surface within reason. Since the fabric tensile properties can be greatly affected by pH values of solution changes during the LbL process alternate dipping procedures, twenty weft and warp yarns received from the fabrics were selected for tensile test. Table 3 shows the tensile strength results of weft and warp yarns received from the untreated, cationized, 10 and 16 nano-ZnO multilayer films–deposited fabrics. Statistically significant difference was not found on the tensile strength values after LbL process. According to these results, it can be concluded that the nano-ZnO multilayer film deposition with LbL process of the cotton fabrics did not cause any significant damage to the structure of the yarns. Antibacterial tests against Staphylococcus aureus bacteria were performed, and antibacterial activity was demonstrated for both multilayer film–deposited fabrics. Cotton fabrics deposited with 10 and 16 layers of ZnO nanoparticle films were dipped in a bacteria containing solution by following ISO 20645 test method. Figure 4 presents antimicrobial activity test results of untreated, 10 and 16 layers ZnO nanoparticle film–deposited cotton fabrics. Nano-ZnO 10 and 16 multilayer film–deposited cotton fabrics showed 1.5-cm and 1.8-cm inhibition zone, respectively. The antibacterial activity test results clearly demonstrate that higher ZnO nanoparticles content with the increase in layer numbers leads to higher antibacterial activity. Figure 5 represents antibacterial activity test results of 10 and 20 times washed 10 and 16 nano-ZnO multilayer films–deposited cotton fabrics. After washing cycles, it was observed that the antibacterial activities of fabrics decreased. After 10 washing cycles, nano-ZnO 10 and 16 multilayer films deposited on cotton fabrics showed 1.2-cm and 1.3-cm inhibition zones, respectively. After 20 washing cycles, nano-ZnO 10 and 16 multilayer films–deposited cotton fabrics showed contact zones. Table 4 shows that the values of percent blockings of UV-A (315–400 nm) and UV-B (280–315 nm) regions are 30.7 and 22.3% for the untreated fabric, 19.47 and 11.2% for 10 nano-ZnO multilayer film–deposited fabric and 14.7 and 7.3% for 16 nano-ZnO multilayer film–deposited fabrics. From this data, it can be seen that the nano-ZnO multilayer film–deposited cotton fabrics showed efficient blocking of UV radiation in both regions. It can be concluded that the presence of higher amount of nano-ZnO has led to the higher absorption of UV rays in both regions as the deposited layer numbers are increased on fabrics. The UPF factor for the untreated cotton fabric is obtained to be 4.16; while it is 8 and 12.3 for 10 and 16 nano-ZnO multilayer film–deposited fabrics, respectively. About two and threefold increase in UPF factor has been obtained with nano-ZnO multilayer film deposition in comparison with the untreated fabric. In the case of nano-ZnO multilayer film–deposited fabrics; the concentration of ZnO plays a crucial role in the enhanced efficiency of UV protection. Nano-ZnO enhanced the UV-blocking property due to the increased surface area and intense absorption in UV region. The higher concentration of nano-ZnO particles present in the fabric with the increase in the deposited layer numbers leads to enhanced absorption of UV rays providing better protection. ZnO nanoparticles assembly for the multilayer film formation on the cotton fabrics were prepared by layer-by-layer deposition process. 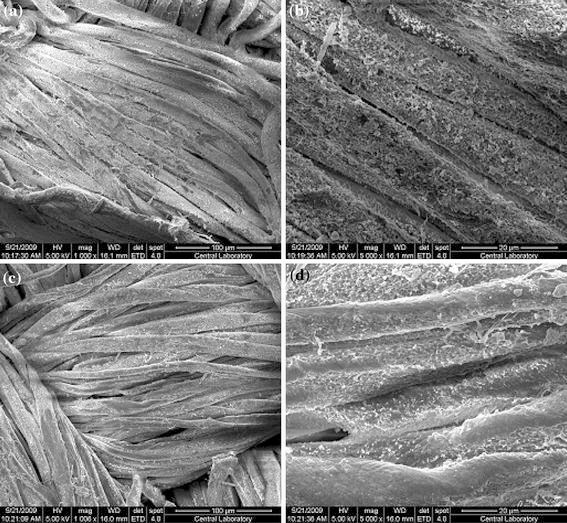 XPS and SEM analyses were employed to examine the nanocomposite multilayer films on the cotton fibers. The SEM micrograph results indicated a significant difference in the morphology of the fibers before and after the LbL deposition process. Elemental analysis showed that there is a linear relationship between the deposited numbers of layers and Zn content. LbL deposition process with ZnO nanoparticles does not considerable effects on the air permeability, whiteness value and tensile strength properties of cotton fabrics. It was clearly concluded that the nano-ZnO multilayer deposited on cotton fabrics showed excellent antibacterial activity against to Staphylococcus aureus bacteria. Cotton fabrics on which nano-ZnO multilayer films were deposited by LbL process were proved to have better UV protection property than the untreated fabric in addition to the efficient antibacterial activity. This work provides a novel and simple method for nano-ZnO nanocomposite film deposition on cotton fabrics and their application onto cotton fabrics to gain antibacterial and UV protection functions. This research work has been supported by research grants from Suleyman Demirel University Scientific Research Project 1814-D-09. We would like to acknowledge Department of Textile Engineering of Dokuz Eylul University for their technical support.